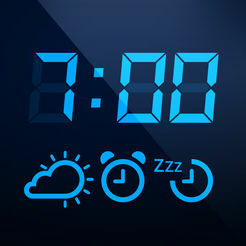 Alarm Clock for Me 2018 IOS (iPhone, iPad, iPod) Wake up and go to sleep to your favorite music, get your own collection of exclusive designer clocks, know weather conditions in your area, and light up the darkness with a powerful built-in flashlight! Choose from stylish designer themes for the clock: Ultrasonic, Digital (Blue, Green, Red, and Yellow), Wordy, Odometer, ThinLine, C-Motion clock. Create your own wake-up playlist with the best music. Background alarm support: alarm will ring even if the app is not running. Go to sleep to your favorite songs or white noise. Check live weather conditions and temperature. Change the screen brightness so that it doesn’t blind you after a good night’s sleep. Shake your device or double tap on the screen to switch on the flashlight. Convenient app settings. Get easy access to any option you need. Widget: access the remaining time till the next alarm and live local weather conditions in Notification Center. Set multiple alarms with different tunes. Background alarm support: alarm will go off even if the app is not running! Easy access to the nearest alarm from the main screen. Vibrate / Fade in / Snooze options. Shake-to-snooze when alarm goes off. 12 or 24 time format. Show/Hide day of the week. Auto-Lock when plugged in ON/OFF. Auto-Lock when on battery ON/OFF. Use the shortcut on the main screen to go directly to the sleep timer settings. Create your own playlist with your favorite songs. Adjust the volume of Music/Sounds. Go to sleep to white noise. 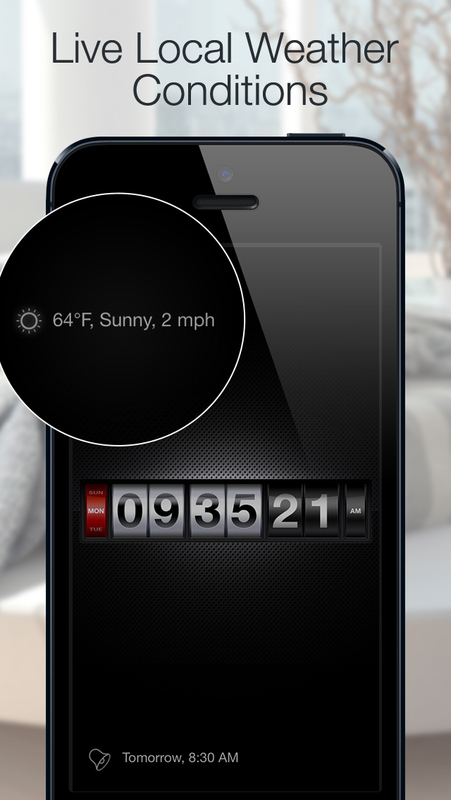 Automatic detection of your current location and weather conditions display in your area. Weather conditions and temperature in any location you choose. We have a new feature – a handy timer tool! No matter whether you are cooking or working out, multifunctional timer will always be at hand!